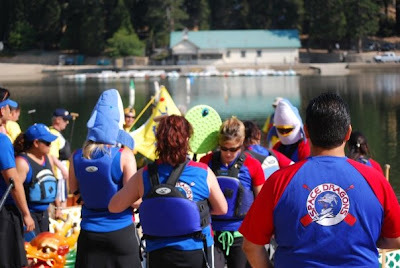 Space Dragons Dragon Boat Racing Team: Lake Gregory! Organized Chaos becomes Wicked Fun! Lake Gregory! Organized Chaos becomes Wicked Fun! 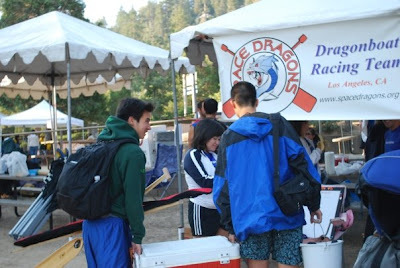 Early morning rises aren't something new to Space Dragons, but a tourney in our local mountains is. Welcome to Lake Gregory, where the air is dry and thin, the water is fresh, and the idea of dragon boating is relatively new. This past Sunday, 32 Space Dragons set out on a quest for glory and came back with full bellies and smiles on our faces. Though they had to endure quick changes to the tournament layout and a certain coach/webmaster constantly yelling at them, these Space Dragons knew how to bring on the fun. Between playing with giant bubbles, frisbees, and feasting on a "fend-for-yourself" turned into defacto potluck, they somehow found time to paddle a few races. At first, the altitude was a bit of a shock to the Space Dragons, as they jockeyed for position during the first couple races. 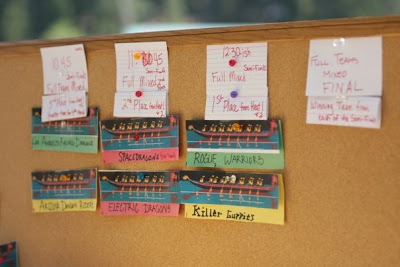 Everyone agreed, the second race felt much better than the first and Space Dragons ended up with 3rd place victories in both the shortie division and the full "Professional" division. 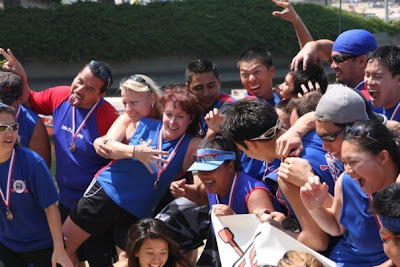 Several Space Dragons were also able to join our Long Beach brethren to form gender teams taking home the gold in Mens and silver in Womens. A long morning's worth of work culminated in the race organizers accepting a Space Dragon proposal of a pursuit race (Thanks Kim for the great idea!). With Brian's masterful steering and Felicia urging us on, the Space Dragons pulled an awesome 4G turn to cut off their competitors and raced into first place! The fruits of our labor led to a victory lap into the fountains of Lake Gregory, wild dunkings, and stuffing of faces. Happy, well fed, and tired from the day in the sun, we all returned home to our beds - dreaming of next year where bbqs and camping await! Mad props go to the race organizers, esp Margaret, for putting on such a fun race, Mike and Dr Chen for introducing the sport to the IE, Phil and LARD for providing generous use of their head cam and to take such nice pretty pictures of us, Dee, Mary, and the rest of Aerodragons for helping set up the LB gender teams, our drivers, steersmen, callers, food providers, "soda" providers and everyone else who volunteered (I roped into helping me out). Thanks guys and see you all out on the water!